Detail of the Anatomical Theatre from View of the University … by E. Sachse & Co., 1856. 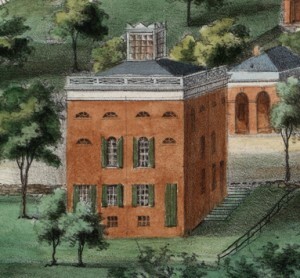 Special Collections, University of Virginia Library, Charlottesville, Va. Welcome to the Anatomical Theatre at the University of Virginia online exhibit. It tells the story of the Theatre’s presence at the University for more than a century. While not included in the earliest plans of the University, the need for the Theatre became clear before the first classes were ever held. Thomas Jefferson himself drew the design which includes two floor plans, a front elevation view, and a cross section. The exhibit traces the construction and later changes to the building, its demise, and archeological investigations at the site. It also gives a glimpse of what happened inside the building and the deeds that were done to procure cadavers so that medical students could learn anatomy.